A police spokesman has confirmed tensions may still be simmering today after they were called to the Brackaville club last night to monitor their annual making of St Brigid’s Crosses which ‘cut up rough‘ according to sources. An altercation occurred soon after 8pm when three men from Coalisland were accused of sabotaging the rushes by squirting glue on the massed bunch in the middle of the floor. Children were reportedly inconsolable at not being able to get rushes off their hands. One of the Coalisland 3 was forcibly removed from the scene, shouting ‘yiz are nothing but a bunch of pagans anyway‘ to the bewildered Brackaville contingent. 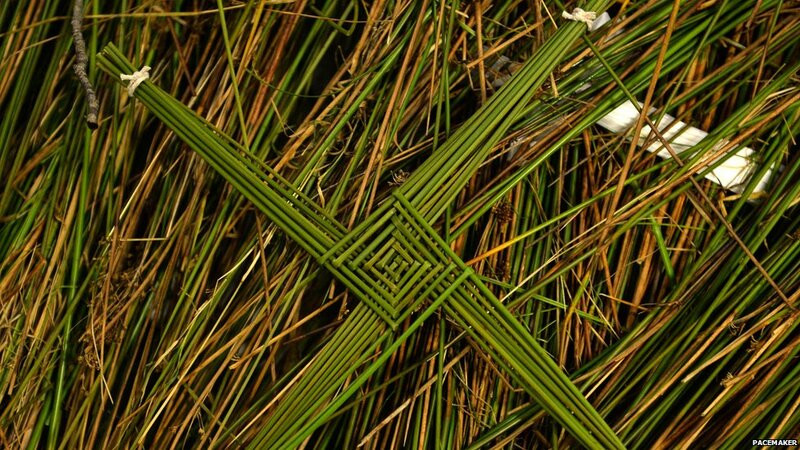 The making of a Brigid’s Cross is thought be a pre-Christian tradition commemorating the goddess Brigid who was one of the Tuatha Dé Danann. A decision on this will be made tonight in The Ceili House pub between a bunch of local pagans and a clatter of clergy. Posted on February 1, 2015, in GAA and tagged Brackaville, ceili house, Coalisland, PSNI, roughan castle, st brigid's cross, swastikas, tuatha de danann. Bookmark the permalink. Leave a comment.